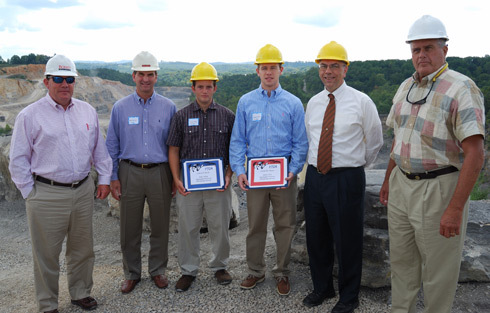 (Left to right)Bill Hamlin, Boxley Materials Co.; Mike Harcum, Carter Machinery; Joshua Morris; Jordan Littauer; Greg Adel, professor and mining and minerals engineering department chairman at Virginia Tech; and M.J. O'Brien Jr., president of Salem Stone. Hamlin, Harcum and O'Brien are members of the Virginia Transportation Construction Alliance, which awarded Morris and Littauer scholarships. BLACKSBURG, Va., Sept. 25, 2009 – Two students in the Virginia Tech mining and minerals engineering department recently won scholarships from the nonprofit industry organization Virginia Transportation Construction Alliance (VTCA). Joshua Morris, a sophomore from Burkeville, Va., and Jordan Littauer, a senior from Richmond, Va., each received a $1,000 VTCA aggregates scholarship for the 2009-10 academic year. Both are majors in the mining and minerals engineering department. The students were honored at a recent luncheon at the Inn at Virginia Tech. The gathering was hosted by local aggregates company Salem Stone, and attended by VTCA board members and scholarship committee members. “I hope to be a production and/or mine planning engineer after graduation,” Littauer said. “Eventually, I’d like to use my minor in business and continue my education to get an MBA. This would allow me to get more involved with the economics side of the mining industry.” Littauer said his interest in mining began when he went on a field trip to a rock quarry with a neighbor. VTCA bills itself as the only association in Virginia dedicated to serving the contractors, aggregate producers, engineers, suppliers, and service providers who design, build, and maintain the commonwealth’s transportation network. VTCA also awards scholarships in the area of transportation engineering and contracting, among others. It raises scholarship money through golf tournaments, silent auctions, and other events, says Sam Hollins, aggregates program manager at VTCA. “Virginia Tech provides the wealth of students who submit applications for the aggregates scholarship,” Hollins said.